Fuel balance pipe • High capacity water separators and fuel filters with audible alarms at lower helm • Individual fillers and vents to port and starboard • Marine grade alloy fuel tanks x 2. A wonderfully cared for one owner example of this majestic model from Fairline. Benefiting from a spacious flybridge with a wetbar including bar, icemaker, fridge & BBQ. There is also a large dinette area and plenty of sun loungers. The main deck saloon, dinette and galley is all on one single level. This example has four cabins and three en-suites with a very spacious owners suite and open plan en-suite. All cabins offer ample storage and wardrobes. She has the aft utility room option. The boat is well covered when not in use including covers for flybridge, cockpit, windows and sliding doors. A must see excellently presented yacht. Full Fairline specification PDF available on request. 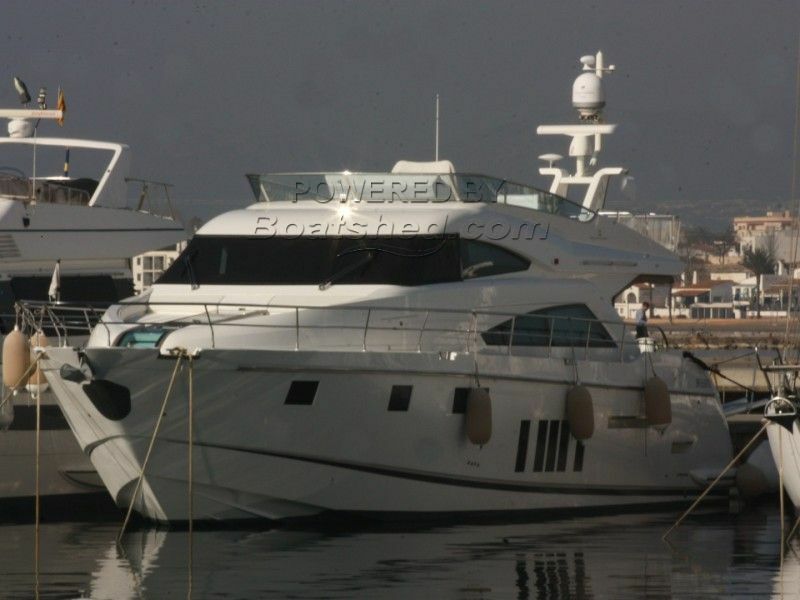 This Fairline Squadron 65 has been personally photographed and viewed by Paul Griffiths of Boatshed Costa Brava. Click here for contact details.